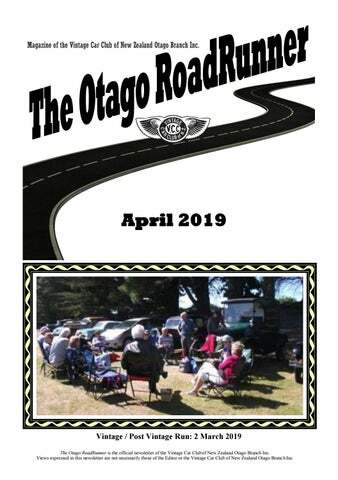 Magazine of the Vintage Car Club of New Zealand Otago Branch Inc.
Vintage / Post Vintage Run: 2 March 2019 The Otago RoadRunner is the official newsletter of the Vintage Car Club of New Zealand Otago Branch Inc. Views expressed in this newsletter are not necessarily those of the Editor or the Vintage Car Club of New Zealand Otago Branch Inc.
Entrant’s (Driver’s) Name:…………...…………………..…………. Address:………………………………………………………………. Vehicle:……………………………………………………………….. Make:………………………… Year of Manufacture……….….…. This award will be issued to all entrants who have entered a club eligible vehicle for the event, irrespective of whether the vehicle has been restored, or an original vehicle ‘tidied up’. To qualify for acceptance, vehicles must have been returned to use, warranted, registered and/or licensed, if applicable before the 31st April 2019. There is no judging associated with this award. The award will be presented to all entrants to acknowledge the commitment and attainment of the member in making a club eligible vehicle roadworthy. Applications for Restored Vehicles which are not registered to be road worthy – will be considered on application. The main objective is to have a simple, fair, equitable event with minimal rules, however it has been found necessary to incorporate the following: The term vehicle is intended to cover all VCC of NZ eligible vehicles. The Restoration Awards cover the period to 31st April 2014. 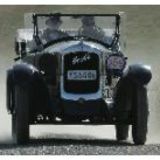 All entrants will be required to ‘fill in’ and return an entry form, with the historic details of the vehicle, together with before and after restoration photos. These documents will be retained by the Branch to form an informal historic register of our member’s vehicles. The owner of the vehicle must be a financial member of the Branch. All entrants will be required to present their vehicle to the event, and may participate in the restoration run. All vehicles presented must have a current WOF and registration - non compliance will be considered on application. Once a vehicle has been submitted for either of these awards, it may not be re -submitted for a minimum period of 10 years, unless there are some substantiated reasons ( ie vehicle rebuilt following a major accident or damage). The vehicle can be rebuilt mechanically leaving desirable original body, frame or paintwork. The vehicle could be completely rebuilt where necessary in every way including having parts, panels, and running gear renewed. A vehicle could be restored using parts from vehicles of a similar model and age. A vehicle would not be discounted if the owner had used the services of others to work on parts of the vehicle, because it is not our aim to have the membership completely competent in all skills required for restoration. A vehicle can be completely rebuilt where necessary in every way, using all the original parts where practical. A vehicle can also be constructed from parts recovered from other donor vehicles of a similar model and age, bearing in mind the final accuracy. According to a Club decision a vehicle built entirely or mainly from new parts would be considered a replica and would for Club purposes be dated from the date of manufacture. E.g. New parts of a 1960’s vehicle used in 1999 would constitute a replica dating from 1999. Accordingly this vehicle would not be club eligible until 2029. VIC Applications – When completing these forms please ensure that you have the most up to date form – check the VCC website as these continue to be updated as procedures change etc. Other Branch Rally Entry Forms - as you will see there are a lot of events happening in and around our region in March. I have emailed details to all members who have email addresses. There are also a few copies in the clubrooms - please ensure you leave at least one copy there, so that others can copy them. Photocopier is available. NNB: Please if you are planning to enter a local event, and running late with entry forms, please contact the organizer by phone or email to let them know you are coming. They need to know numbers for printing the instructions, and catering purposes for some events. Spare Parts Shed – Parts shed is usually open every Wednesday morning Friday evenings when the clubrooms are open. Reminder – see if you can effective recycle your parts before scrapping them. NO TYREs by request. The nearest AED defibrillator to the clubrooms is on the outside wall of the 4 Square shop on corner of Bayview Road. Please make a point of familiarising yourself of its location – never know when it might be needed. SOLD OR SELLING YOUR VIC’D VCC VEHICLE ENSURE YOU SEND VIC CARD ALONG WITH CHANGE OF OWNERSHIP DETAILS TO NATIONAL OFFICE – Remember this paperwork is the property of the National Club – this is their way of keeping records of Vehicle ownership etc. MIDWEEK RUNS - The next run will be the Thursday 28th of March. Meet at clubrooms by 1pm. BYO afternoon tea. If weather not suitable for a picnic, we will go to a café. Vero Insurance Scheme - Just a reminder, the VCC Vero insurance scheme is set up for those with current VCC membership. If they have insurance cover under the VCC Scheme with Vero, current membership is a requirement. Club Night - Guest Speakers As the last Friday of April is the end of Easter Week, it has been agreed that we would not have a speaker for this month. We have speakers arranged for May and June – these will be confirmed next month. National Executive Meeting - Nicola has been at the National Exec Meeting the weekend that this was going to print. She reported that the National Motorcycle Rally will go ahead as a separate event to the International Rally in 2021. Many Motorcyclists had indicated that they did not want to see it incorporated into the International Rally. This is a great result. More on the Exec meeting in next months Roadrunner and at Club Night. BRANCH AGM 16th of June The AGM will come up quicker than you think. As with our new rules, all committee members are voted on for a two year term. Some of which will have reached the end of their term this year. We have had some great committee members over the years, they all bring their own touch of expertise, and enthusiasm to the group. Yes there is also time commitment involved. We would like to see this continue. Please consider putting yourself forward for a term on committee this year. Get to know how things work behind the scenes. This is also a great way to get to know your fellow branch members. Nomination forms will be out in next monthâ&#x20AC;&#x2122;s Roadrunner. Sunny Blenheim hosted this event and with almost 190 entries some from Australia, the UK and Netherlands it was a great gathering of like-minded Vintage bike enthusiasts. Seven from our branch entered - two stayed for the four day after tour rides, while the five “younger” boys returned to work after the rally itself. Meet and greet on Friday night was a catch up with folk we hadn’t seen for a couple of years as the Nat rally is a biennial event. Saturday sunshine was typical Marlborough weather so an interesting selection of bikes took off on their timed rally, finishing at Havelock for the lunch stop. On Sunday at Omaka for the public day the field tests were shortened to one due to the fire risk and it was so hot just a few bothered to compete, most staying under trees or in the coffee café out of the sun. Prizegiving dinner was at the Convention Centre, Stewart Gutsell did well winning the Vintage Section, he also gained third place overall, a fine effort by him. The Southland boys did very well and it was great to see a young chap on a Veteran from down there win the Overall Trophy. Almost half of the entry stayed on for the rest of the week. Monday was a ride to Nelson with two visits to private motorcycle collections. Quite a few returned to Blenheim via the Golden Downs to St Arnaud, the Wairau Valley a total of about 220 miles, enough on an elderly bike in such hot temps - well it was for me! Tuesday was a visit to a shed full of motorcycles at Seddon and what a variety of bikes to see. Very close to Seddon was a massive vineyard to visit, and a ride of a few kilometres through the grapevines. Wednesday we lined up at the Picton boat harbour to take a 20 minute barge trip to Torea Bay and a ride over the hill to Portage. As the barge would only take ten or so bikes and riders it took about 3 hours to ferry eighty or so bikes and riders, interesting though. At a bay on the way to Havelock a barbeque lunch was put on and back to Blenheim for a “rest”. There is talk of the next rally being in three years time rather than the normal two due to the 2021 Vero, but this was not a popular decision with the motorcyclists. Lets hope we can continue with the two year rallies. Snippets Never before in NZ have we seen seven beautiful four cylinder Veteran and Vintage motorcycles parked in a row. Mum and Dad de Boer came from Holland, as they do every two years. Their two sons Geert and Mark also came riding two Veterans purchased in NZ some time ago. Both belt drive machines performed well with a little fettling on the way. BSA and Triumph were the most popular bikes in the entry list about 25 of each.